Update: Current Offer is for 20,000 miles with first purchase. Consider instead applying for another credit card on the Best Travel Credit Cards page. This Lufthansa Munich First Class Lounge Review is part of a trip report including First Class and Business Class to Moscow on Lufthansa, with reviews of luxury hotels and dining in Moscow and St. Petersburg, Russia. I've had quite a few visits to top-notch hotel club lounges such as the Four Seasons Hong Kong Executive Lounge and a number of Ritz-Carlton Club Lounges, but very few top-tier airline lounges. I won't count U.S. domestic business class lounges, which to me seem like a bad joke–often crowded, with no appealing food options, and sometimes surly employees. But clearly Lufthansa's First Class Lounge is another animal altogether. Since I was arriving on a first class flight but departing that night on an intra-Europe Lufthansa business class flight, I wasn't 100% sure they'd let me in, although I'd read reports that even at Frankfurt's First Class Terminal they generally did allow arriving Lufthansa first class passengers who had a same day connecting flight in business to use the FCT, even though it's really mean for passengers departing on Lufthansa first class flights. So I decided to try my luck, since I needed to get online anyway, and very much wanted a shower to freshen up. I pressed the buzzer and was buzzed in, showed the agent my first class boarding pass, and asked if I could use the lounge. She asked to see my connecting flight, and also had me hand over my passport to a separate customs officer who kept it for the duration of my stay in the lounge. I'd asked her about a plug adapter, not having been able to find my European adapter before I left, and she escorted me to the bar, where they keep them, taking your boarding pass to ensure you don't forget to give the adapter back. 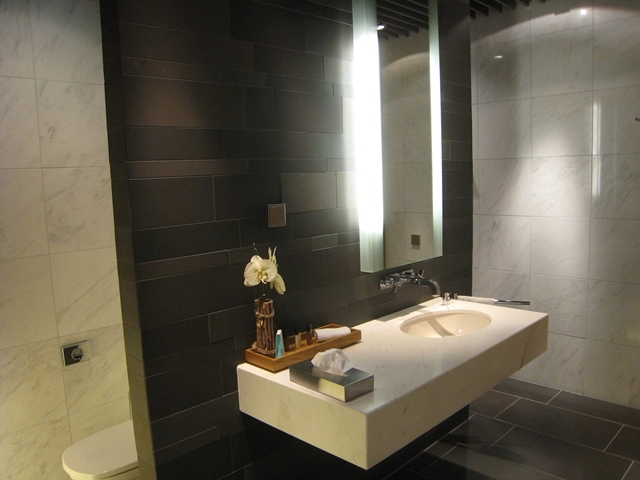 Although it was all quite regimented, once inside the lounge, I began to appreciate it more. 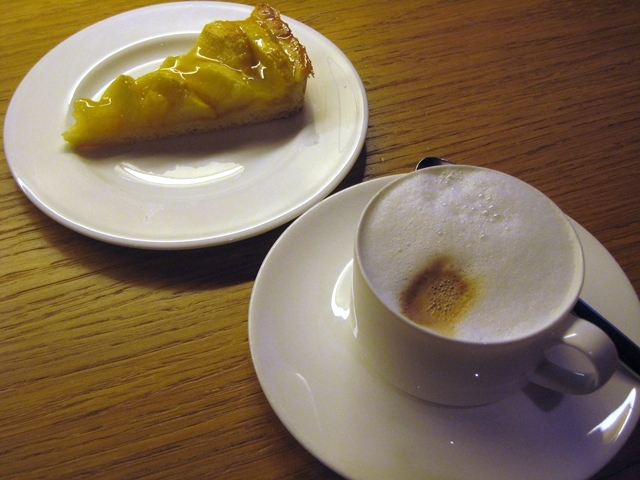 I first sat down in one of the several office rooms and checked email, while enjoying some kaffee und kuchen–a cappuccino (machine made, but still decent) and slice of apple tart (very good). Then it was off to have a shower. The attendant was friendly, although seemed slightly flustered responding to my English. And indeed, the majority of other visitors that Saturday were German speaking, and all men with the exception of one German mother with two energetic little boys. 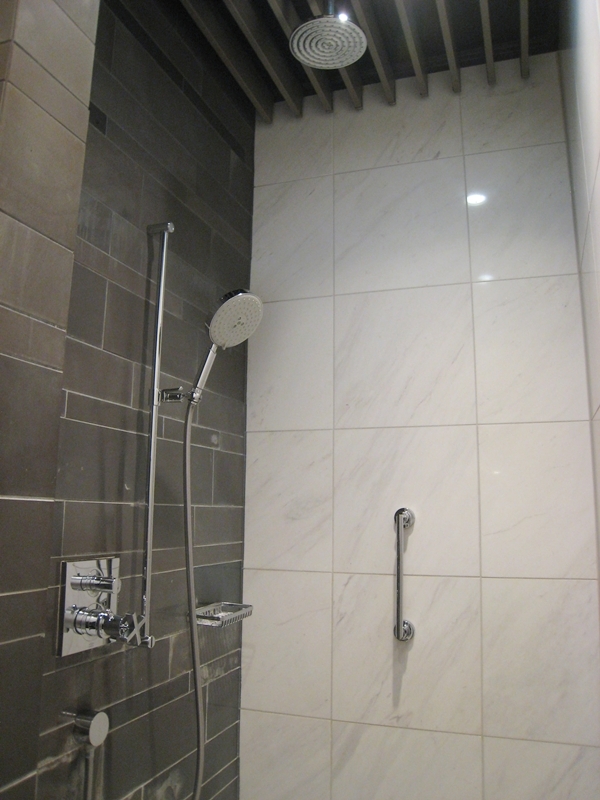 The shower room was a lot nicer than the Swiss shower room I had at the Swiss Arrivals Lounge in Zurich. Not only did it not flood (better design!) it was a lot more spacious, with a separate alcove for the toilet, a large bench to put your things, extra towel, etc. 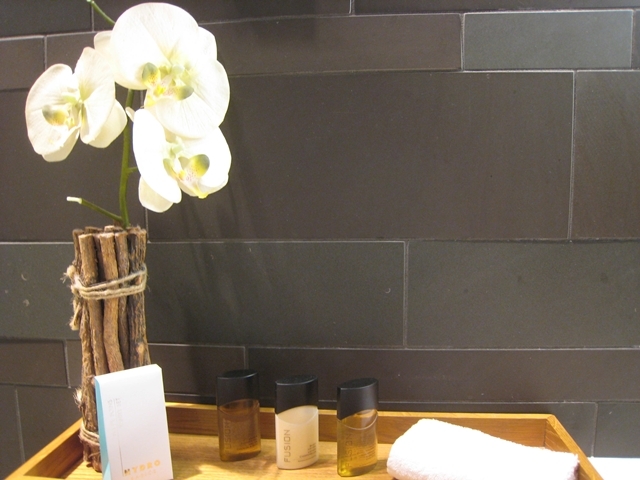 The Fusion bath amenities left something to be desired, since they had a strong Sandalwood scent to them, but not a problem since I always bring my own. The shower had both a rain shower fixture and regular nozzle. After freshening up and doing a bit more work, I was hungry. I checked out the buffet, which had various salads, sushi, smoked salmon, a large fruit plate, cheeses, breads, an array of desserts, etc., but I was drawn to the nicely set tables which had their own menu. It was also set with the classic Lufthansa rose, which was lovely and so civilized. I prefer cooked to order food over most buffets, so I sat down and was warmly greeted by both a young woman server and an older male server. 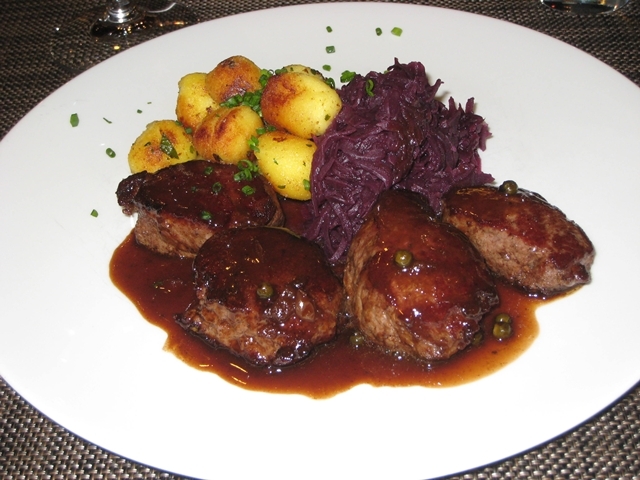 For lunch, I chose the venison medallions (when was the last time you were able to order venison at an airport lounge?!) which came with a chocolate pepper sauce, red cabbage, and gnocchi. I accompanied with a glass of cabernet sauvignon. Let me say, this was SO much better than the pre-flight supper at the Lufthansa IAD Lounge prior to my flight in Lufthansa New First Class. Not even close. And it was filling enough that I was glad I hadn't ordered an appetizer, and sorry not to have any room for dessert. Since the day was quite rotten outside, I gave up on heading into Munich for a few hours, and decided to just get more work done in the lounge. About 5 hours later, and an hour and a half prior to my flight, I decided to have a light dinner of soup and dessert. 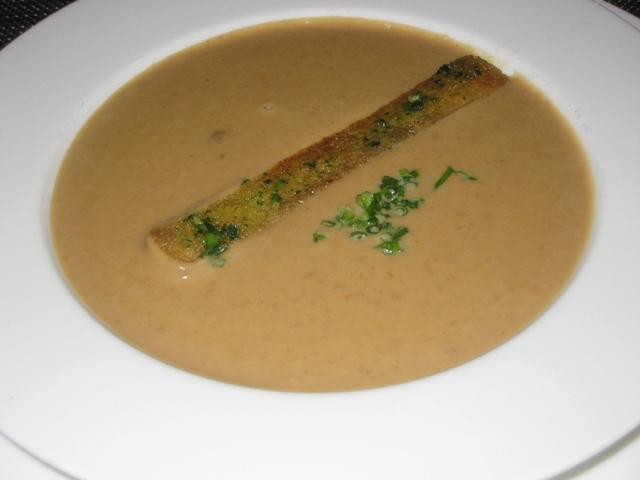 I can't recall exactly what they called this creamy chestnut soup, but it was silky and delicious, at least if, as I do, you like chestnuts. I find it such a quintessential fall flavor and surprisingly not used that much in American cooking apart from, say, stuffing at Thanksgiving. Simple, rich, and satisfying. I finished off with probably my 4th fresh passion fruit of the day (the novelty of fresh passion fruit in an airline lounge clearly hadn't worn off on me, plus it was channeling that luscious fruit bowl and passion fruit welcome drinks at the Amankila in Bali), a strawberry, and a couple cookies. 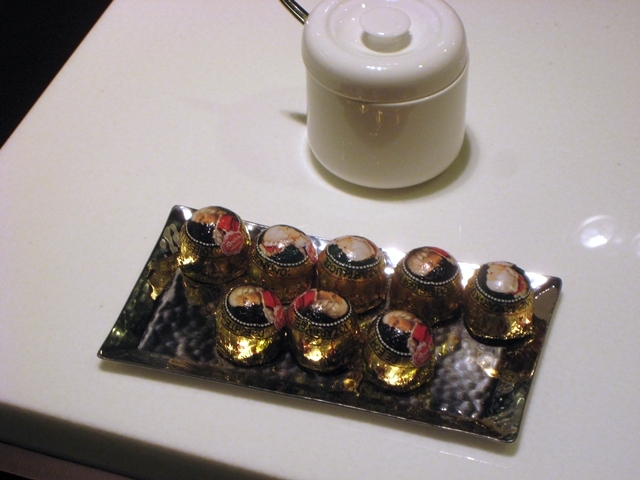 The kind server also brought me a little plate of chocolates, which I saved to take home for the munchkin. Actually, there were trays of Mozart candies all around the lounge–talk about SO much better than stale pretzels, chips, packaged cookies, etc. that you find in U.S. lounges (ok, I know it's not fair to compare those lounges to a Lufthansa First Class Lounge, but still). The only thing I wasn't crazy about, although fortunately it was pretty well self-contained, was the Cigar Lounge. It was pretty amusing though–I still don't get cigars or smoking in general, but it certainly managed to have at least one person puffing away in there at all times. As noted above, Lufthansa' First Class Lounges are really supposed to be for passengers departing on a Lufthansa First Class international flight; but typically you'll be able to also use the lounge if you are an arriving Lufthansa First Class passenger with onward travel on Lufthansa, whether in business class or even coach, as per Alexander's comment below. Note that you must be an arriving or departing first class passenger on Lufthansa or Swiss metal; if you're arriving or departing in first class on another Star Alliance carrier you're out of luck. You are allowed one guest if s/he holds a boarding pass for the same flight as you do; and you can also host your spouse or life partner and children under 18 if they have same day boarding passes. You do not have to be flying on a revenue ticket; anyone traveling on a Lufthansa first class award ticket as described above can be admitted, so it's a nice additional perk of flying Lufthansa. As covered in my prior post, I prefer using United miles earned from the Ink Bold, Ink Plus and Sapphire Preferred sign up bonuses and spend, since with a United roundtrip award you can get a free United one-way, and also because United, unlike US Airways, doesn't block Lufthansa first class award availability (although you may encounter some phantom availability). I can better understand why people get excited to visit Lufthansa First Class Lounges now. The ability to order excellent dishes to order seals it for me, since that's something that you don't even get (apart from a few dishes such as eggs cooked to order at breakfast) at even most top hotel club lounges. 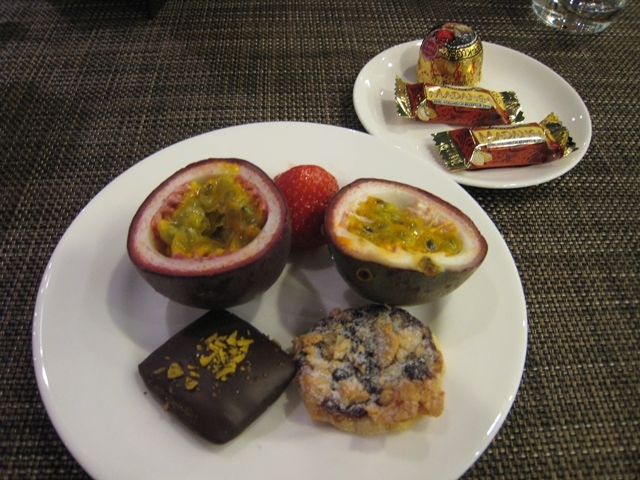 That said, you can bet the buffet items at the Four Seasons Hong Kong Executive Lounge are a LOT better quality-wise than the buffet options in the Lufthansa First Class Lounge. But of course, with the Lufthansa First Class lounge you're getting it included in the price of your award ticket, and you most definitely won't be staying at any Four Seasons for the miles and points from a few credit card applications. If I had to criticize, I'll say that what I really want in more top tier airline lounges is a sleeping room or area where you can lie down. I've done this at the British Airways lounge, where there's a sleeping area, and I know that Etihad also has some sleeping rooms, first come, first served. Even the Swiss Arrivals Lounge in Zurich apparently has a bedroom, although I didn't have occasion to see or use it. Update: apparently there are sleeping rooms, per Deborah and Alexander's comments–I should have asked about them! Although as they're apparently near the entrance and you hear the foot traffic, I probably wouldn't have been able to get to sleep anyway. 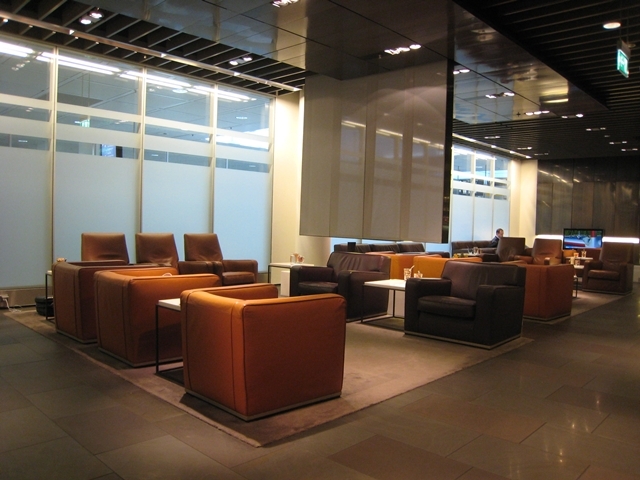 Have you been to a Lufthansa First Class Lounge or the First Class Terminal in Frankfurt? What did you like most about it?